Singer, writer, actress, director, artist. Gu Hye Sun can do it all it seems. She wrote the book The Peach Tree and turned it into a movie which at times was very poignant and the acting…you can’t fault the acting…too much…and then it wasn’t the acting per se but maybe more like a very awkwardly written situation on a whole. It was a good movie overall with a very sad ending. I think, though, like some plots can, it suffers from a lack of substantiality and believability in certain respects because movies do have very short time in which to build connections and make us believe. A truly good movie is one that can touch us and make us believe for the one and a half to three hours the movie runs. 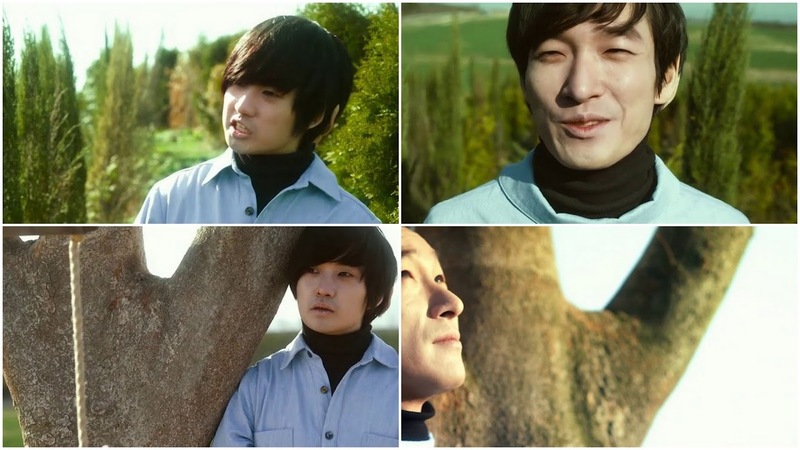 The movie revolves around the life of conjoined twins Choi Dong Hyeon [Ryu Duk Hwan] and Choi Sang Hyeon [Jo Seung Woo]. They are not your normal conjoined twins joined at the hips or arms or even on the back. There might be some joined head cases, but nothing like the conjoined heads in this story. Dong Hyeon has pretty much the entire body while his brother inhabits the back of his head. That’s right. Sang Hyeon has no other part of the body to call his own, which makes you wonder how he could even survive for as long as he does. And I know this is sooo in appropriate, but I can’t help but recall the two-headed dragon from the animated Disney movie Quest for Camelot where the one head introduces himself and then introduces the “growth on his neck”. Nam Sang Mi as Park Seung Ah opens the movie by stopping by the window of the shop she used to work at and then going into a bookstore to buy the children’s storybook The Peach Tree and she narrates the story to a little boy she happens to run into. The start of the story talks about how people would consider the twins’ appearance as that of a monster, but they were not monsters, just different. We then cut to the meat of the story. 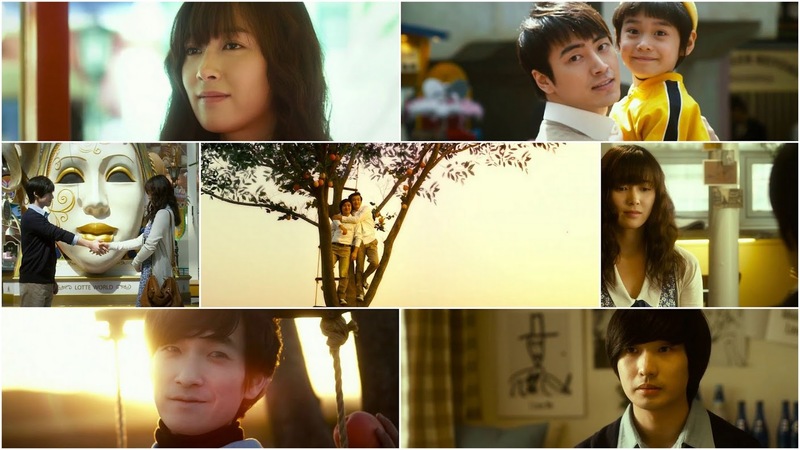 Their parents [played by Seo Hyun Jin and Lee Joon Hyuk in the younger years] lived a normal and happy life. They dated under a peach tree and collected its fruit. They were excited to have their own peach-colored child be born. Things were going great for them until the actual birth when they got something they had not bargained on—the “monstrously” conjoined twins (which, Sang Hyeon later describes, were actually born in the shape of a peach…but how does that make sense when Sang Hyeon didn’t have a body to call his own?). The mother went bonkers after that and on a stormy day tried to kill her newborn children, but her husband stopped her in time. The doctor wanted to give at least one of the twins a normal life. It was doubtful that Sang Hyeon would be able to survive very long, so why not sacrifice his life so that his brother Dong Hyeon can have a normal existence? Mr. Choi balked at this. When they are older, when they are older. Truthfully, that is actually the worst thing he could do is wait. While it is horrible to think of killing one twin for the sake of the other, it would have been easier on everyone all around if it had been done right away, but then we wouldn’t have a movie. I’m not saying I would have been able to make that choice very well either. But why did Mr. Choi make the decision that he did and then, in a way, dote more so on Dong Hyeon than Sang Hyeon? I think it’s kind of up in the air whether or not the mother’s health got the better of her or if she committed suicide. Sang Hyeon, who narrates the entire story, talks about the last letter their mother left behind…so I think it could have been suicide, but that really isn’t 100% clear. For Dong Hyeon, going to see their mother was the worst thing ever. He was frightened of her. His twin, however, was excited and was always smiling. The last time they saw their mother she was somewhat normal and then she freaked out on them and they ran away to the peach tree. They climbed up it to hide from her and Sang Hyeon talks about that final moment where it was the last they saw their mother and how she smiled beautifully. From this point on we get to hear Sang Hyeon constantly say he feels everything is solely his fault, which he starts iterating from this point in the movie forward. Ah…I know in the case of normal twins how they can determine hyung and dongsaeng because one always comes out first, but conjoined twins? Dong Hyeon always calls Sang Hyeon his hyung. How is that possible? Just wondering. Did Sang Hyeon’s head come out face up while Dong Hyeon’s came out face down? Fast forward who knows how many years, and the twins and their father are holed up in their house and never go out. They rely on a family friend to bring them books and other necessities. Dong Hyeon is very touchy and can be quite selfish, but given the situation and even his father’s extreme care of him, I guess it’s to be expected more or less. Mr. Choi is definitely more considerate of the son who could be normal and goes out of his way to bring him books and other things which does not please Dong Hyeon. As for Sang Hyeon….you have to feel badly for him as he doesn’t get the attention and care that his little brother does and you know it’s more self-sacrifice for him since he believes it’s all his fault the family is so unhappy and his brother can’t live a normal life. But…you can’t fault yourself for your own birth. It’s not like Sang Hyeon asked to be born like this just like Dong Hyeon didn’t either. It gets confusing between narration, thoughts, and conversation. It’s really hard to determine who’s talking, if they are talking aloud, or having private thoughts or if it’s part of Sang Hyeon’s narration of their story. It definitely could have been done a little better for clarity’s sake as I really did get confused quite often during the movie. The times where Sang Hyeon was really down on his existence, I believe that is his private thoughts and nothing he shares, but there are just too many instances, especially when you cannot see both faces of the twins, that you just don’t know what’s what. So in order to help Dong Hyeon, Mr. Choi goes in search of the deaf photographer friend who took the last picture of his wife before their children were born. He finds the studio, but it’s now a clothes shop. This is when Seung Ah steps into the picture. She’s an aspiring cartoonist doing caricatures at an amusement park while trying to get her work published with no luck. Enter Mr. Choi with his map for a hat (he turned it into a hat because it was pouring out) and that’s food for her illustrations. Now, this is a part of the plot that is downright weird. I have NO idea why Mr. Choi thinks looking for that woman would help. I also have no idea why Seung Ah would follow that man blindly and get into his car. Maybe she knew right away he’d do her no harm, but still. Very bad of her. Hearing that she draws and was recently fired from a publishing company, he hires her to make his son’s [Dong Hyeon’s] dream of publishing a book come true. And for whatever reason, Seung Ah agrees to this and heads to the Choi house with nothing but the clothes on her back and her purse. Seung Ah is sent to a room to spend the night and told that she will be introduced to his son the next morning. So awkward and weird. Dong Hyeon hides his poor brother by wearing a hoodie with a deep hood and breathable material. Poor Sang Hyeon. He and Seung Ah get along rather well together. Sang Hyeon narrates that she was a beacon of light in the darkness for them. Dong Hyeon’s book that he’s writing? It’s essentially the story of him and his brother, so it’s the book we see Seung Ah with earlier. Seung Ah puts things in a new perspective about the condition of the twins, not knowing it is a true story. But she does spin a very positive light about while it is hard and they will suffer, it is also a gift that they never have to be alone in this world and will always be there for one another. It’s very odd. The way time passes in this drama. The funny thing is that the scenes, even though our actors are wearing the same clothes (not like Seung Ah had a change to spare), don’t seem like one continuous day. It feels like it’s several days stretched out. But then it seems like it’s only the next day and Mr. Choi went back to the shop to request Seung Ah’s friend pack some clothes and necessities for her. So…was it really only a day Seung Ah spent with Dong Hyeon hearing his story and drawing out some rough sketches? I did have to laugh when Dong Hyeon gets affronted when Seung Ah draws him as uglier than Sang Hyeon. Seung Ah states that it would not be fair if the practically whole twin was good-looking, too, but she does end up complying with the request. Mr. Choi comes back home and finds Seung Ah wandering around the house late at night. Dong Hyeon is working hard at writing the draft of the story while Seung Ah was nodding off. She goes into the twins’s room and notices the odd setup of mirrors. There are two mirrors opposite each other so the two can see each other and themselves at the same time. She then finds the room where the last portrait of their mother is. This scene gets really awkward when Mr. Choi catches her. The whole thing was awkwardly played out with a very weird vibe that didn’t seem to quite fit. While Seung Ah was taking her impromptu tour and explaining that she can’t stay another day as she can’t lose her job, Dong Hyeon looks through her sketchbook and finds her ID. He takes it and “hides” her sketchbook under the table. While Dong Hyeon sleeps later that night, Sang Hyeon (the poor boy was reading Anne of Green Gables but has to stop every time his brother rolls over) catches sight of the ID on the nightstand. Seung Ah comes knocking and Dong Hyeon covers up his brother quickly with his hoodie and searches for the missing ID he had. Where did it go? I have NO idea how Sang Hyeon managed to, but he had her ID card in his mouth. How was that possible? Also, Sang Hyeon doesn’t have hands of his own, how do the pages get turned so he can continue his stories? Seung Ah goes to work at the amusement park after dropping the manuscript off at the publisher’s. The publisher is showing more interest in this work than any other work Seung Ah has worked on. Seung Ah says the author is a close friend of hers. We, as the audience, know that this interest is only because the publisher was sent a baby picture of the twins. I don’t know who sent it or how they got their hands on it, but they did. Of course, Seung Ah doesn’t know all about this. Dong Hyeon shocks his father and the family doctor by leaving the house to return Seung Ah’s ID card. The woman hides on him to sketch him in private. She’s so busy drawing she doesn’t notice he’s engulfed in a crowd watching a parade. When she realizes this, she recalls Dong Hyeon has a social disorder and she quickly rushes into the crowd to find him. When she does, a child has pulled off the hood and her eyes meet Sang Hyeon’s. Seung Ah doesn’t think too much about it at first and apologizes for getting the wrong person, but when she turns around her expression looks very surprised and contemplative while Sang Hyeon looks oddly…heartbroken? Meanwhile, the Choi house is empty. I think Mr. Choi may have been looking for his sons…or maybe he went out again with the family doctor. The publisher and a swarm of press descend, break into the house and go around taking pictures. Mr. Choi finds them first and stands dumbly. Meanwhile, they pounce on the twins who run away and get cornered in the room containing their mother’s portrait. Sang Hyeon’s face is revealed and Dong Hyeon stubbornly keeps his face hidden. To protect his precious brother, Sang Hyeon bites the hand of the man who tried to turn their heads to expose both their faces. This earns him some punches and the horrible people stand around taking pictures as he cries out for them to please just leave them alone. Cruel. That was just cruel. After that the people fled like an angry monster was after them which was even crueler. This was the weirdest and most awkward scene to top any of the other awkward scenes. The press barged in uninvited and Mr. Choi did nothing to stop them when he found out they were their and could only stand dumbly and stare at the bloody face of his eldest son. What the heck was up with that? I was very disappointed in that scene overall. The publisher then commands Seung Ah to get the picture they couldn’t to build up the hype behind the story. Seung Ah is definitely very conflicted about this. She sits in the story playing with the camera when she notices a regular customer of the shop uses sign language. She chases after the woman, but no luck. Seung Ah then heads over to the twins’ house. She listens to Sang Hyeon read Anne of Green Gables for a while before she sits down and talks to him. I think she may have been reading him the story his brother wrote. She then connects the dots. The reason why Dong Hyeon wanted to write a children’s book so much was because of how much Sang Hyeon loves to read children’s tales. Sang Hyeon, deep down, knows this. 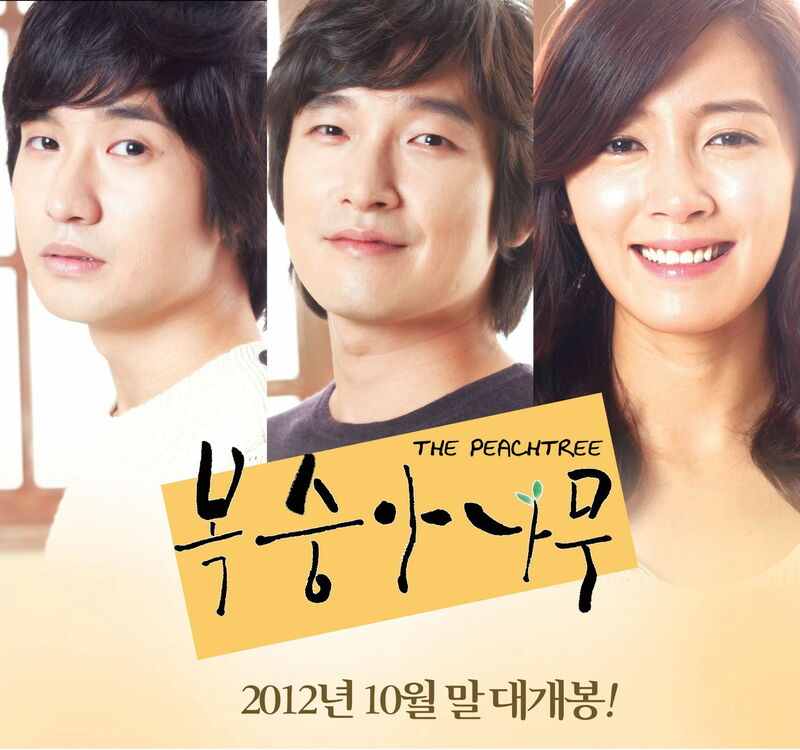 He then talks about their peach tree and asks Seung Ah to come view the blossoms with him. Seung Ah promises to do just that and you know that Seung Ah really means to keep that promise as she really is a good person and genuinely likes the brothers (tho it is a bit odd how much she likes them given we don’t have a very long time frame that they’ve known each other but time does mean nothing sometimes when it comes to feeling connections with people). I don’t know how much time has passed, or if there really was more than a day. Seung Ah is out buying peaches while Dong Hyeon, who had earlier cried and talked about having the surgery (which would effectively kill his brother) just so he could be like everyone else at long last, confess that he hated Sang Hyeon, but at the same time, the only thing keeping him alive was Sang Hyeon. It’s a Catch 22. And then this is another odd scene. Sang Hyeon talks about how he had scene their mother’s beautiful smile on the last day they saw her. We then get him falling. I can’t tell if Dong Hyeon leapt off the ladder or if Sang Hyeon influenced it in someway…it’s all very odd. But needless to say, the twins are rushed to the hospital after this incident. Seung Ah hears the siren and drops her peaches and rushes to the hospital because some sixth sense of hers knows the twins are in there. Before the “accident” Sang Hyeon was wondering if she would really show up or not. I think she was buying the peaches, thinking of them, and getting ready to go. Would what happened have happened if she had been a little faster? Anywho, that’s neither here nor there. For whatever reason they decide to perform the separation surgery. Seung Ah arrives as it is being performed and runs out crying. She rushes to the shop and takes the only male mannequin (who she lopped its head off at the beginning of the movie when the publisher threw out her drawings) to give to Sang Hyeon. She cries and tells him to take that body with him and come back whole in his next life. Fast forward. Several years. You know it has to be several years for something they do. What did they do? We cut back to Seung Ah finishing the story. She apologizes saying she can’t give the book to the boy. The tram stops and the father (played by the same man who played the twins’ father at the very beginning) collects the boy and something goes off in Seung Ah and she takes another look. It’s implied this boy is the reincarnation of the sad Sang Hyeon. She then goes to meet with Dong Hyeon who is whole once more (well, he was never NOT whole) and…how can his head be perfectly round? Can they round out the cranial bone? It doesn’t seem likely that they’d be able to and it seems highly unlikely from the way the heads were conjoined that Dong Hyeon would have a perfectly normal shaped head. But, I digress. She hands over the book and he confesses from the day it was published, he could not read it. He then wonders how his brother could have seen their mother’s final smile when his was the head facing her at that time. It’s a mystery. And that’s it. The acting was good. Scenes were stilted and awkward played out, but I have a feeling that is more pacing and writing issues than solely acting ones. I can’t say I hate this movie, because i don’t. It’s just missing that small percentage to make it a truly great movie. But overall, the message and theme is interesting. Seung Ah may have been surprised at the boys’ appearance, but she genuinely accepted them at face value (no pun intended). I get the boys were interested in her, but I don’t really get the whole love thing that the plot synopses talk about. Sure, Sang Hyeon calls her the light in the darkness, but I think it’s more so because she gave the twins a chance to realize dreams, if they had any, and finally put them in touch with the real world (even if there was harshness in it). One thing I really didn’t like was how Mr. Choi cried at the end about how he knew nothing about his son. Yes, he should feel badly about not knowing Sang Hyeon’s tastes, likes, or dreams. But it really seems too little too late. Was it because knowing Sang Hyeon wouldn’t be the twin to last very long that he focused so much more so on nurturing Dong Hyeon? Then what was the point of keeping both twins alive for nearly 30 years?